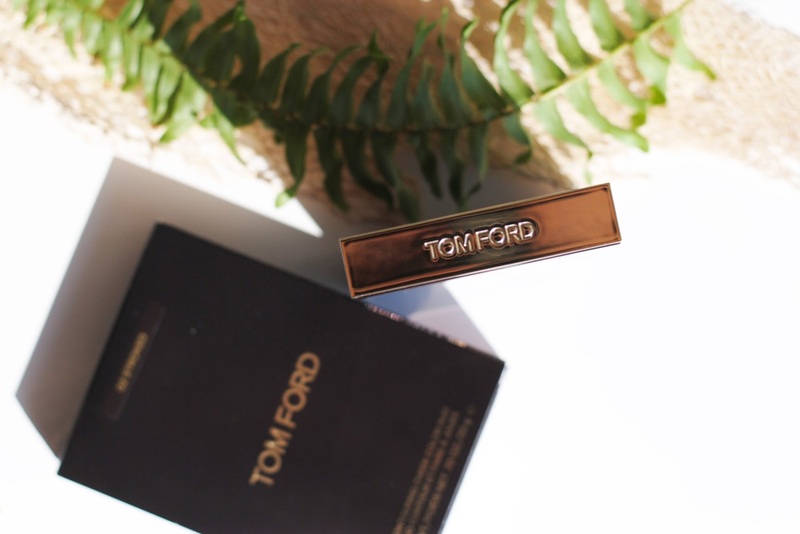 How I love Tom Ford. I only had some Tom Ford lipsticks, so when a friend of mine came across the palette that I've been eyeing for so long I didn't hesitate. Hello Stroked, hello Ruby Rush, hello rave review! 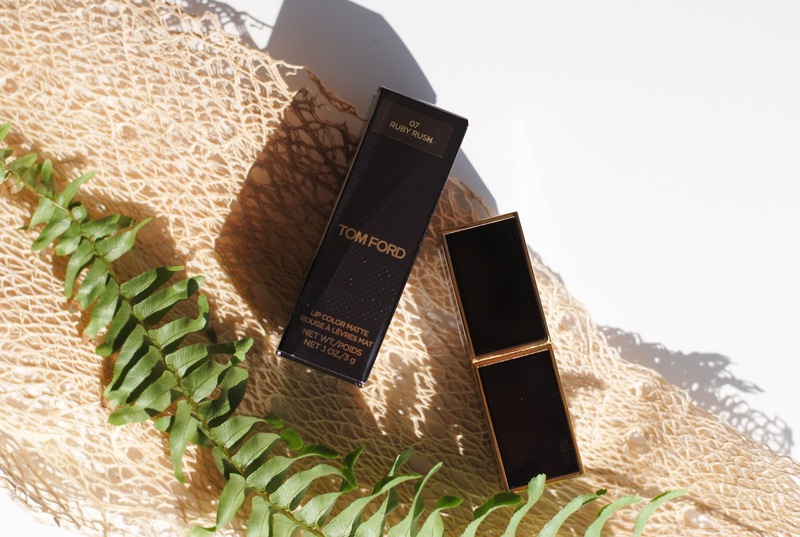 You know I love plum/berry/wine colors, but Tom Ford surprised me with Plum Lush (review), the first pink lipstick that I wanted and it's still the only pink one that I wear. I do have some red lipsticks, but I never wear them because they don't look as good on me as darker colors. That was until I came across Ruby Rush and decided to give this ultimate red a try. 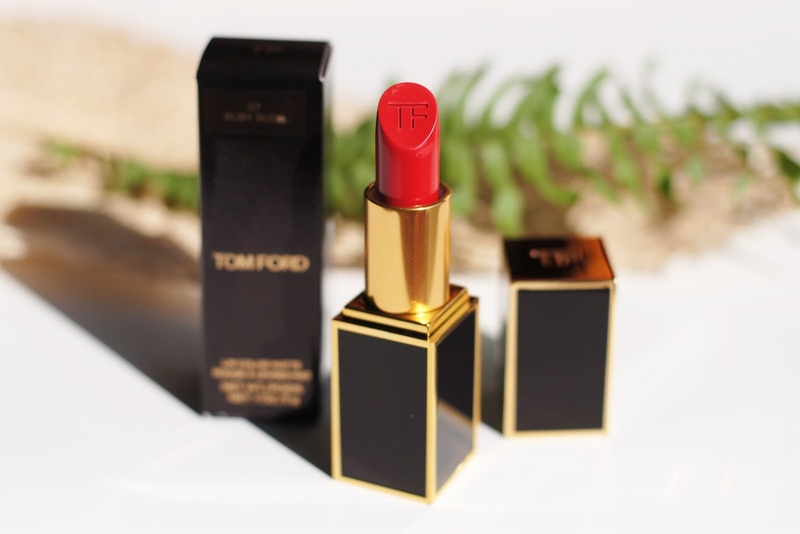 And wow, I am -again- completely blown away by a Tom Ford lipstick. 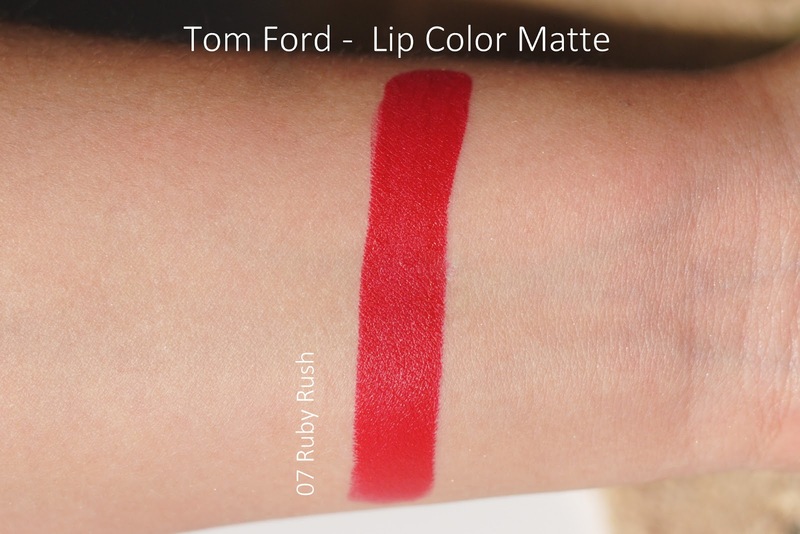 The color is gorgeous, a deep red with the supermatte Tom Ford finish as we know it. The lipsticks are still my favorite: long lasting, vanilla scented, not dry, nothing even comes close to these. Ever since I saw a review of a Dutch blogger and googled swatches I fell in love with this palette. 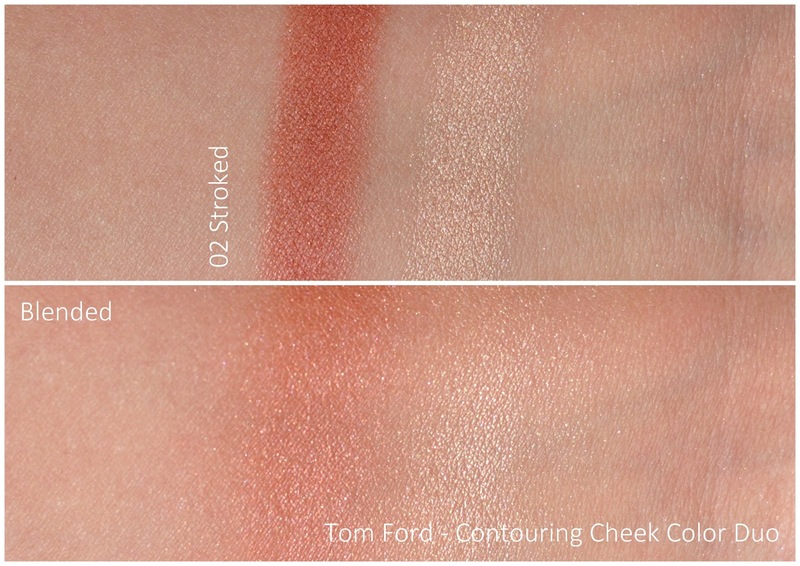 The Contouring Cheek Color Duo in 02 Stroked is a blush and highlighter palette. It's actually really big. 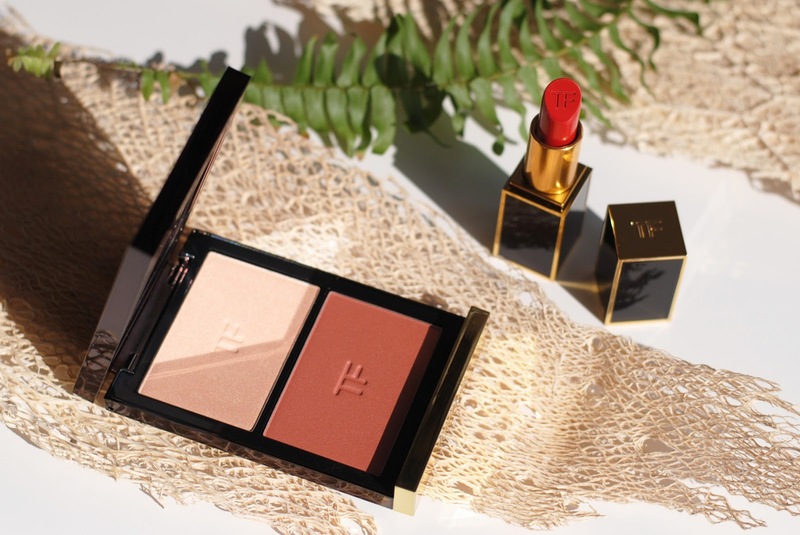 I expected the size of a YSL palette, but this one is much bigger. (And they're even around the same price.) It has a brown casing with gold details. 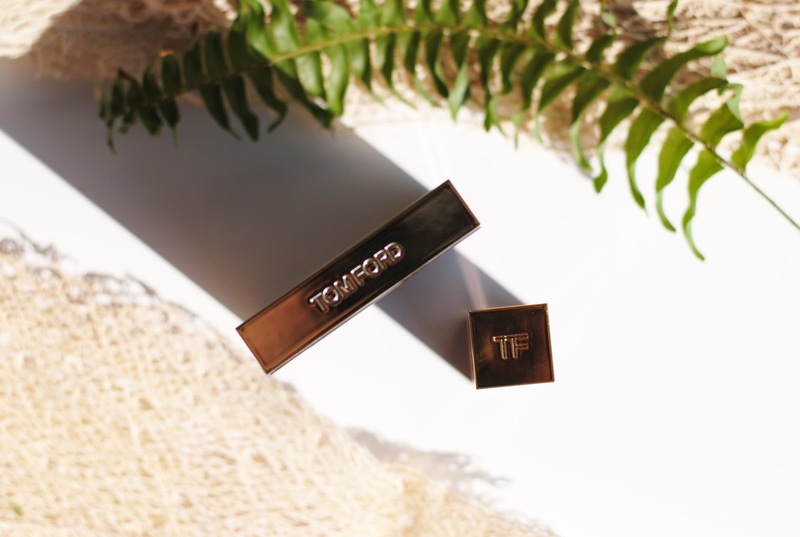 Very simple, very Tom Ford. The palette doesn't come with a brush (sadly), but the big size of pans makes it up for me. 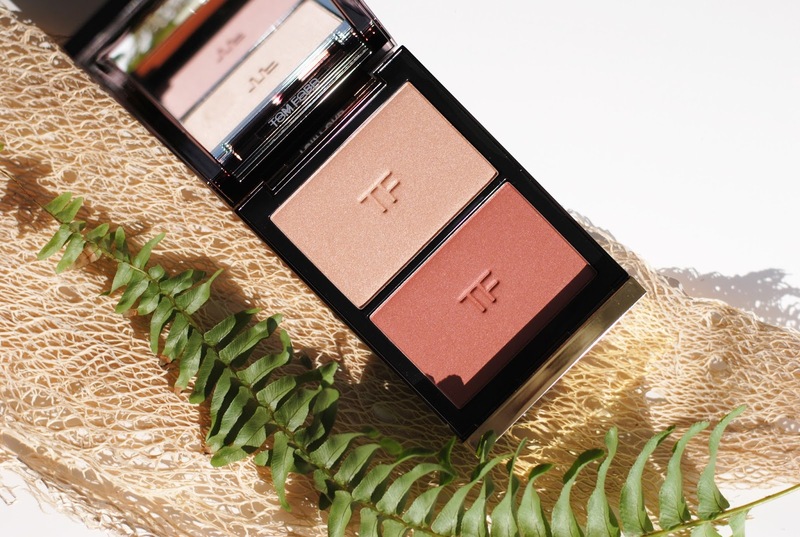 Lots of 'oohs' and 'aahs' when I first tried this highlighter. I have a lot of highlighters, but this one is just the perfect color to me. It's very light, but not white. White can be too harsh on my cheekbones, and gold too dark. Stroked has a nice, subtle champagne glow. I would have bought the palette just for this highlighter, because I really needed a color like this. And it's one of the only highlighters that deliver the glowy effect that I want. It's also highly pigmented by the way, just like the blush (which I really overdid the first time!). The blush is a color that I've been wearing a lot lately. 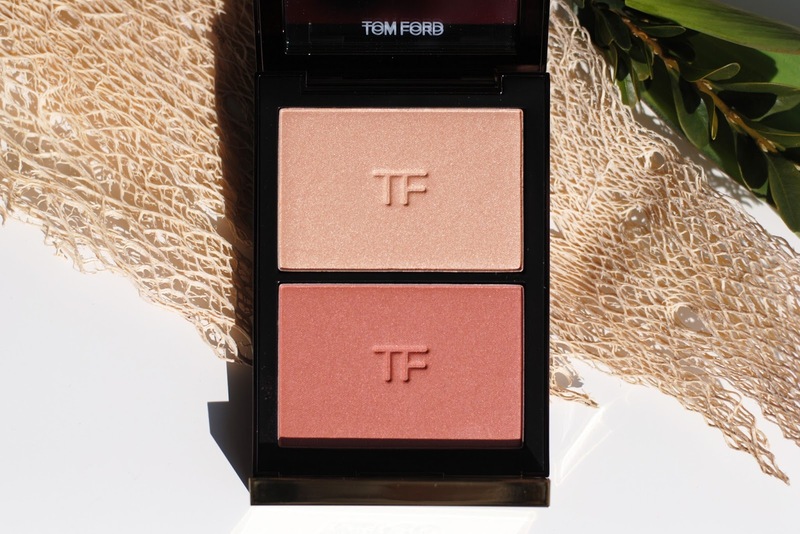 It does look a bit like my last two favorite blushes (Zoeva blush palette & Hush from the UD x Gwen palette), but this one from Tom Ford is more orange. The blush is matte, with some gold shimmers. Unusual combo, but it absolutely works. I told you this was going to be a rave review. 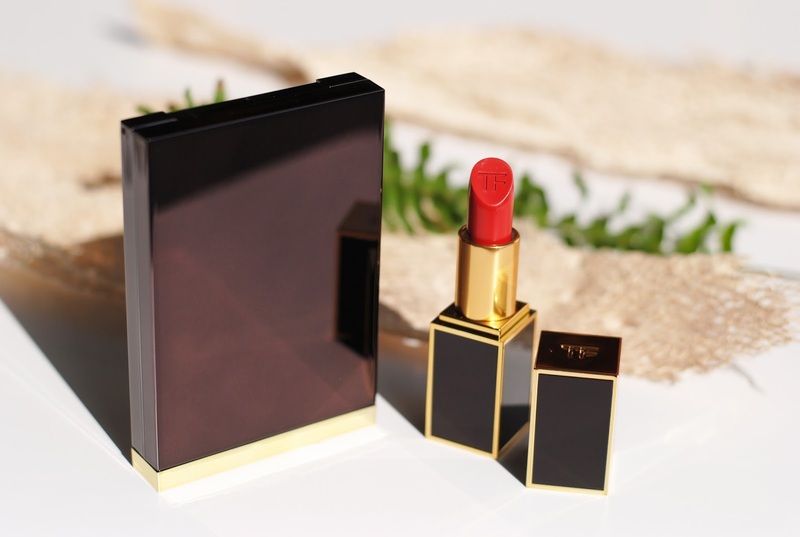 I love the Tom Ford lipsticks, they're my absolute favorite and Ruby Rush is a nice addition. An ultimate red, and an ultimate musthave. The palette is amazing. 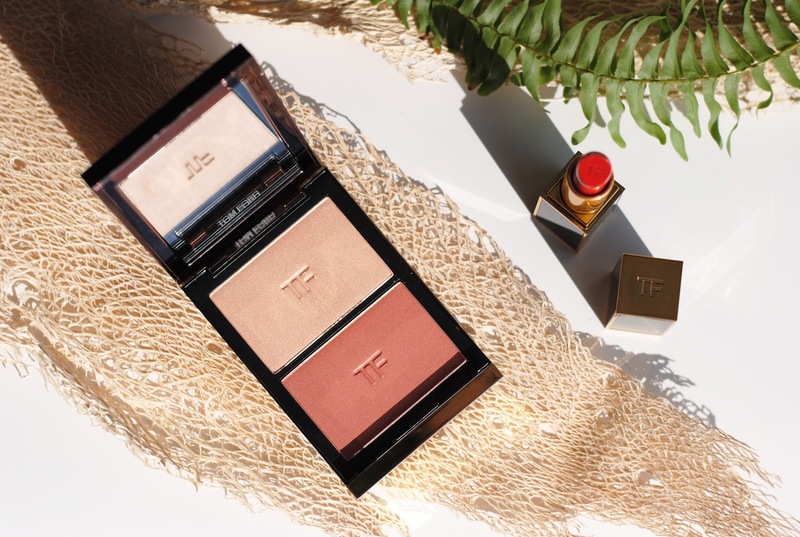 I am over the moon with the highlighter, it's exactly what I've been looking for. And the blush is a warm color that adds definition and freshness. Now I just want to add Velvet Violet, Black Dahlia and Pussycat to the tiny lipstick collection. What do you think about these Ruby Rush and the palette? Really love the Ruby Rush. It's a perfect color for you! 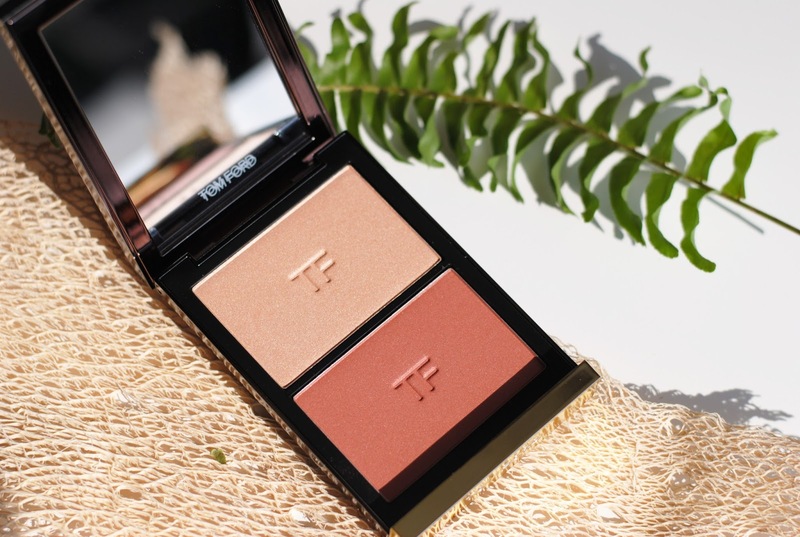 But the palette is amazing too, the champagne color of the highlighter is just beautiful. 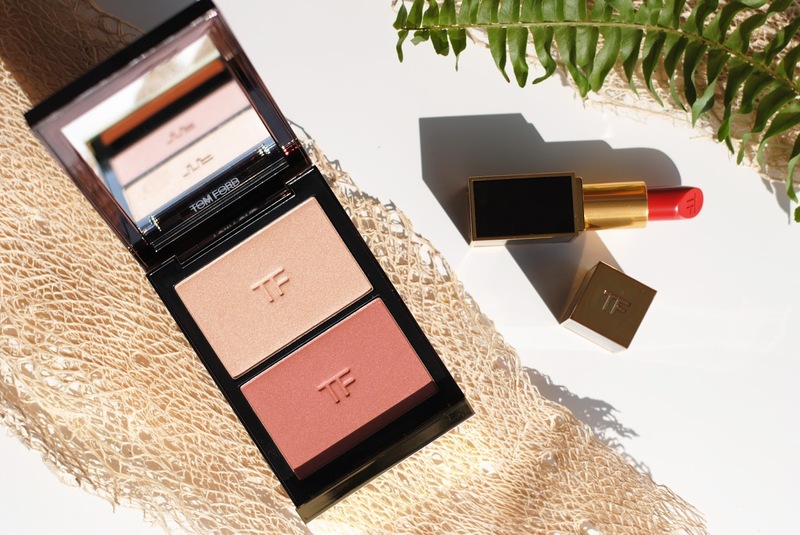 Wow die Contouring Cheek Color Duo is echt een must-have. De swatches zijn werkelijk prachtig. Gorgeous pictures RANI! Love love love that red lipstick! And wauw, Ruby rush is prettaaaay!!! Wow, everything is so utterly exquisite! Zalig mooie producten! De verpakking is al helemaal top, maar de inhoud mag er zeker zijn.